The successful promotion and development of Kent as a tourism destination through the partnership of the public sector and tourism businesses was celebrated recently at County Hall, Maidstone. The event, part of Visit Kent’s tenth birthday celebrations, recognised the importance of tourism to the county’s economy, and was attended by senior representatives from Kent County Council, other local authorities, and some of Visit Kent’s 90 business investors. Amanda Cottrell, Chairman of Visit Kent, said: “Over the past four years the county’s tourism industry has grown by ten per cent. It currently supports 63,000 jobs and contributes a massive £3.2bn to the Kent economy. This has all been achieved by the combined efforts and commitment of local authorities, tourism businesses and the Visit Kent team based at Canterbury. “It is totally appropriate that we celebrate our birthday by returning to County Hall, the crucible where the Kent Tourism Alliance, which later became Visit Kent, was created. 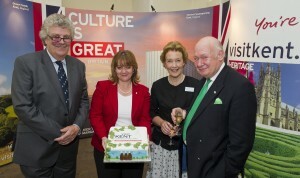 Thanks to the foresight of Alex King and others at Kent County Council, and formed in direct response to the impact of Foot and Mouth and 9/11 on the visitor economy in 2002, Visit Kent has developed and is now recognised as a national model for how tourism destinations should be promoted. Echoing the words of Amanda Cottrell, Mark Dance, Kent County Council Cabinet Member for Economic Development and Regeneration, said: “It’s timely to celebrate the optimism of Kent’s tourism industry in the year of the Dickens Bi-centenary, the Queen’s Diamond Jubilee and 2012 London Games. Visit Kent’s team has also been influencing national campaigns. Initiatives, such as Kent Greeters, have been adopted nationally and the ‘My Kent Big Weekend’ is currently being considered as a model for other counties to follow. Sandra Matthews-Marsh, Chief Executive of Visit Kent, said: “The past ten years have seen some very successful campaigns, notably the ‘Kent Contemporary’ which presented potential visitors in London with new and unusual perspectives of the county. “Having recognised the ability of the Visit Kent partnership to deliver a real return on investment, Kent County Council showed its commitment to the industry and played a critical part in the ‘Kent Contemporary’ initiative. Guests at the event were able to enjoy a slice of Visit Kent birthday cake, as well as Kent strawberries, and sparkling wine and apple juice from award-winning Biddenden Vineyards.